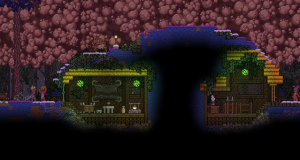 A Floran Hut Village dwelling. Floran Hut Villages are a Floran themed village made up of a number of small, partially underground huts. The dwellings are similar to those found in a Floran Treetop Village, except they're all buried underground. Basic treasure can be found in most containers while valuable treasure is in themed chests. Valuable treasure chests also contain Alien Steaks and at higher rates. Champion's Spear Display Decorative 400 A display commemorating the spear of a Floran who won a hunting ceremony. Covered Plant Bedroll Furniture 105 A Floran prisoner bedroll covered with a blanket. Crude Bench Furniture 85 A crudely made bench. It's had a lot of use during Floran hunts. Empty Weapon Rack Decorative 60 A Floran weapon rack. All of the weapons are missing. Floran Statue Decorative 80 A statue of a Floran holding a spear menacingly. Huge Primitive Cabinet Storage 240 The cabinet made of leather stretched between four large tusks. Hunting Weapon Rack Decorative 80 A Floran weapon rack. Unsurprisingly, many of the weapons are gone. Large Brown Pelt Decorative 160 A large pelt with thick, lustrous fur. Large Floran Statue Decorative 250 A statue of a Floran. It looks like a great hunter. Large Primitive Table Furniture 105 This entire table appears to have been carved from a single, enormous bone. Leather Support Decorative 55 A piece of thin leather is stretched from the ceiling. Overgrown Chair Furniture 75 A wooden chair overgrown with vines. Primitive Bench Furniture 125 A bench made of wood and bones. Seems... inviting? Primitive Chair Furniture 75 A simple wooden chair with bone accents. Primitive Couch Furniture 150 A couch made of leather hide and large bones. Primitive Countertop Furniture 85 A cooking countertop used for chopping meat. Primitive Curtain Decorative 60 A curtain, or a slab of half-dried, half-eaten meat. One of the two. Primitive Door Door 95 This door is hardly suitable for keeping the weather out. Primitive Stool Furniture 55 A tiny stool carved from bone. Ramped Platform Furniture 115 A raised platform. Don't get stuck under it. Short Primitive Table Furniture 70 A table made from many small bones. Small Black Pelt Decorative 70 This pelt serves as a Floran hunter's trophy. Small Cabinet Storage 70 A small cabinet with a table top. Small Primitive Cabinet Storage 100 A cabinet adorned with huge, sharp fangs. Small Primitive Table Furniture 70 A table fashioned out a small tree topped with a slab of wood. Small Snowy Pelt Decorative 70 The pelt of a small, snow dwelling animal. Spear on a Plaque Decorative 60 A Floran spear mounted on a decorative plaque. Tall Wooden Torch Light Source 30 A large flickering torch warms the air around it. Thatch Block 0 Traditional thatched roofing. Tiny Bongo Decorative 45 A bongo drum fashioned out of leather and wood. Vine Door Door 95 A door made from interlocking vines. Wooden Gate Door 10 A crude wooden gate. Not very secure.